New Delhi : After announcing deals with sprinter Hima Das and football club Real Kashmir FC, adidas India continued to add to their partnerships by signing India’s first gold medal winning heptathlete Swapna Barman who won the gold at the recently held Asian Games in Indonesia. adidas is aiming to catalyse a change both on and off the sporting track for India’s talented youth through its belief, ‘Through Sport, We Have the Power To Change Lives’. Many of the brand’s associations in the recent past have been focused on empowering youth in India and making a positive change. As a leading sports brand, adidas understands the need to encourage youngsters towards sports, so that, there is absolutely nothing that limits aspirants from achieving their dreams. Swapna Burman came into the limelight when she became the first Indian Heptathlete to win an Asian Games Gold at the 2018 Asian Games in Indonesia. Not only did her spectacular win get everybody’s attention but so did her 12 toes (6 on each foot), which in spite of being a challenge, weren’t able to diminish her spirits. Swapna won admiration and accolades for battling physical discomfort and pain to create history. 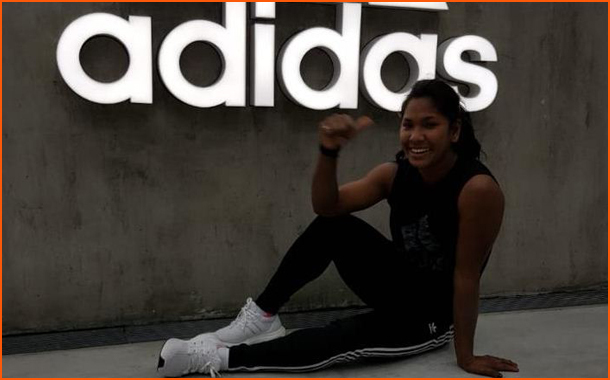 Over the last 2 months, adidas has worked extensively with authorities in India and their own Athlete Services lab at the headquarters in Germany to seek a solution for Swapna. The brand has decided to support her by designing customized high-performance footwear and shall be providing her with seven unique pairs, one each for the seven different events of Heptathlon. Swapna recently visited the adidas Athlete Services lab in Herzogenaurach, Germany, where a detailed footwear analysis was carried out. The customised footwear made especially for Swapna after this analysis means she will no longer have to squeeze her 6 toes into shoes made for 5 toes. Recently, adidas signed sprint sensation Hima Das, to support her in her journey towards becoming the best sprinter in the world. In addition, the brand partnered with Real Kashmir, the first team from Kashmir to ever qualify for I-League. Both these stories along with that of Swapna show the power of sports to positively change lives. Indian athletes such as Rohit Sharma, Kuldeep Yadav, Rishabh Pant, Dipika Pallikal, Zeel Desai, Nikhat Zareen, Siddhanth Banthia, Manjot Kalra, along with international athletes like Lionel Messi, Paul Pogba, Naomi Osaka, Caroline Wozniacki, Wayde van Niekerk and Gladys Cherono among others wear the 3-Stripes with pride.